“Drones in the Outfield” may become the next big cinematic baseball hit. 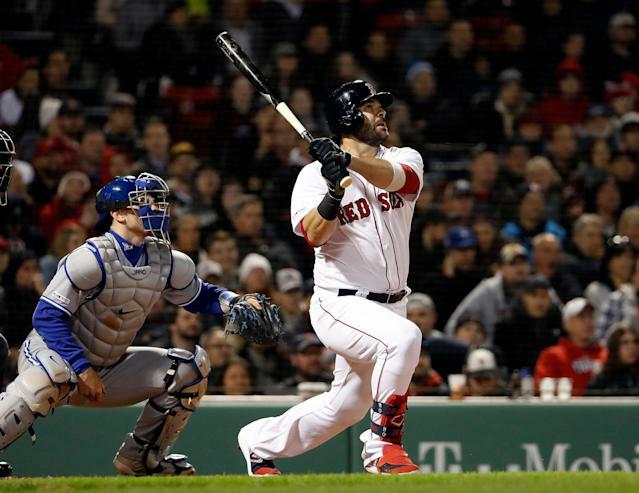 It at least may have helped Mitch Moreland and the Boston Red Sox secure a walk-off 7-6 win over the Toronto Blue Jays during Thursday’s game at Fenway Park. It’s the first home victory of the year for the reigning World Series champions. A drone was seen illegally flying near the batter’s box during the bottom of the ninth inning during his at-bat, drawing the attention of everyone in the stadium plus the FAA and Boston Police. An investigation was immediately launched, and a breakthrough was made Saturday. The drone was recovered, and the operator was identified as a juvenile, Boston police said in a statement. The investigation remains active and ongoing at this time. Fans caught the drone on camera flying near a stadium light on the third base side. According to NBC Sports Boston, security noticed the drone earlier in the game when it flew over the river near Fenway. It returned and reportedly made two passes of the stadium while the Boston Police Department searched for the pilot outside the park. FAA regulations prohibit drones from flying over stadiums during events. Drones are not allowed to be within three miles of the stadium from between one hour before the game to one hour after. Permits and waivers can be issued for a drone’s use; the FAA is looking into if one was given, per CBS Boston. The Red Sox said it was unauthorized. Drones are also prohibited from flying over 400 feet in the air while within five miles of an airport. There have been some issues with drones delaying air traffic at the nation’s largest airports. The drone was a DJI Phantom released a few years ago by DJI. The company told WCVB 5 in Boston it was prepared to work with authorities on the investigation. "Whoever flew this drone over the stadium apparently overrode our geofencing system and deliberately violated the FAA temporary flight restriction in place over the game," the company told WCVB 5 in a statement. DJI has been continuously improving its Geofencing No-Fly technology. It sets up temporary geofences, such as the Olympics, G7 summit and stadiums during games. It retains them over airports, nuclear power plants and stadiums. A geofence is like an invisible fence one would use for dogs in the backyard, but better. It uses GPS data to access the drone’s location. If it comes near the geofence, it will hover there instead of going further. Some geofences can be broken, with DJI able to attain access to the pilot’s identification, while some pilots are able to hack the system through a lengthy process. Moreland tied the game in the seventh with a home run, only to have the Blue Jays’ Freddy Galvis match it with his fourth hit of the night in the eighth. Toronto led, 6-5, when the drone came back. Moreland was up to bat in the ninth with one out and Mookie Betts on first after working a walk when the drone buzzed overhead. He had to step out of the batter’s box for a moment. "It kind of threw me off," Moreland told reporters. "I looked up and was like, 'They’re not supposed to have these around here, are they?' I figured I’d try to hit it or something." His double tied the game and Eduardo Nunez replaced him on the basepaths, moving over on an intentional walk and a stolen base. Rafael Devers hit his first career walk-off single for the win. Red Sox manager Alex Cora said he expects someone to make a T-shirt out of the drone situation, per NBC Sports Boston. The incident came the night before Boston police held their news conference about public safety at the Boston Marathon. The 123rd running of the Boston Marathon is Monday. There is a no-drone zone over the runners and the spectators. It includes the entire 26.2-mile route snaking through the city and ending at Boylston Street. Police began using drones a few years ago to scan crowds and thwart low-key attacks. They are flown over the starting line where a huge crowd gathers between there and the village, but are not flown overhead while the participants are racing.